InstaForex provides its clients with cutting-edge trading technologies and services of utmost quality. Thus, customers of the broker have an opportunity to trade binary and expiry options, trading instruments that hit it big. Every client gets access to options contracts on 72 assets and can choose either call or put options. For the full list of available instruments, you can go to your Client Cabinet´s section devoted to options. You can use dollar, euro, and ruble accounts to buy options. What´s more, you can trade US Cent and EUR Cent accounts. Under the trading terms of an intraday binary option, its validity period cannot extend one day, while its minimum expiration time is one minute. Meanwhile, expiry binary options can be valid up to two weeks. To streamline its customers´ trading process, InstaForex placed a price chart in Options Cabinet that allows you to opt for more convenient time frame. Moreover, Options Cabinet as well as the website contains archive quotes details that can come in handy in your trading. Some sections are devoted to statistics on your current and previous trades. InstaForex offers a wide range of trading instruments for binary options trading. In particular, there are 21 currency pairs, two metals gold and silver as well as nine CFDs on shares. You can view an extended list on the website. Options trading is one of the most attractive ways to trade on Forex as it brings stable profits. Customers can calculate their potential earnings just multiplying an options value by a standard profit coefficient equal to 1.8 pips. The maximum loss is limited to the contract price, i.e. a value of an option is debited from a customer´s account upon the purchase of an option. In case of a winning trade, a client gets back the contract value plus profit. If the result is a losing trade, only option´s price is withheld. However, even the slightest price fluctuation will bring you profit. Yet another advantage of trading options with InstaForex is the absence of limits on the number of trades per day. A deal will be declared winning in any circumstances when the price of an option moves along with the chosen direction. Especially for its clients, InstaForex developed one more useful service that enables customers to assess a potential amount of profit. Options Cabinet contains a form you can fill in to calculate profit. Thus, InstaForex binary options have a gamut of advantages. They are easy to trade, have a wide price range and high profit coefficient. All risks and losses can be measured beforehand. And finally, money-making process does not depend on market conditions. 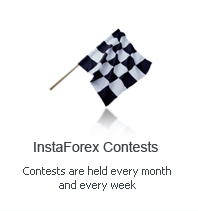 InstaForex offers special terms for beginners on Forex. They have an opportunity to trade options on so-called demo accounts. The service is available in Demo Account Cabinet. InstaForex makes options trading even simpler!